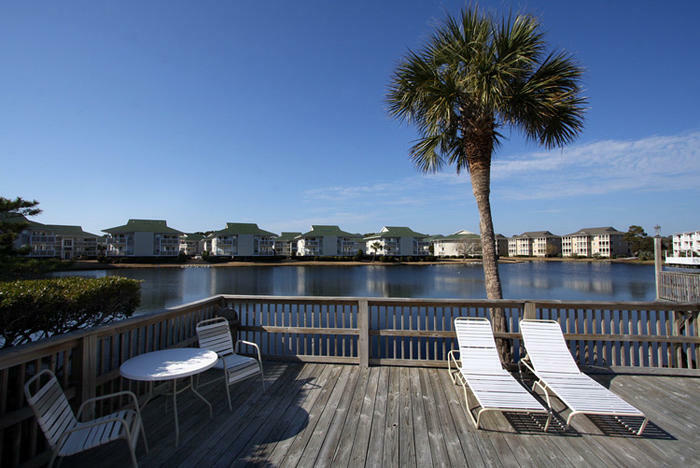 This small North Myrtle Beach resort is across the street from the white sandy beaches of the Atlantic Ocean while also being on a lakefront setting. Comprised of two buildings with a swimming pool, hot tub and kiddie pool spread out on the wooden deck in between them, Bermuda Run is a quaint and accommodating North Myrtle Beach resort. It is a North Myrtle Beach resort that is nestled in the Cherry Grove section of North Myrtle Beach, South Carolina. Palm trees, pergolas and lounge chairs are part of the poolside landscape and breezes constantly blow in from the ocean and the lake. Bermuda Run is a four-story North Myrtle Beach resort that is perched on stilts. Each of the two buildings of this North Myrtle Beach resort features stairs on either end of the hallway and an elevator in the middle. Covered parking is available on the ground level beneath the buildings. Getting from your car to your North Myrtle Beach vacation rental at Bermuda Run is quite easy, which is nice when you are carrying luggage, groceries or newfound souvenirs. ideal for an active family vacation where you play hard all day at the nearby amusements and sleep well all night in the privacy of your spacious North Myrtle Beach condominium. Elliott Beach Rentals is not affiliated with onsite management or the HOA of Bermuda Run.